November 8th, 2009 (8:57 PM). Edited June 27th, 2018 by Bela. Hi, my name is Star! I am the creator of this hack. Don't mind me, though! I take care of things behind the scenes. 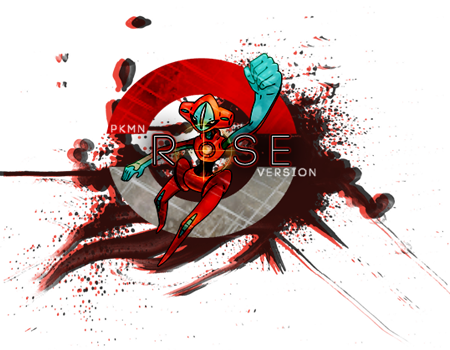 I'll take just a moment to introduce Pokémon Rose Version to you! The Centiq (/sĕn-tēk/) region is a place rich in history. Understanding that history is important for understanding its future. Your journey as a young trainer will take you from the depths of dungeons to the tips of mountains, from the happiest of places, to the dark hideouts of evil. 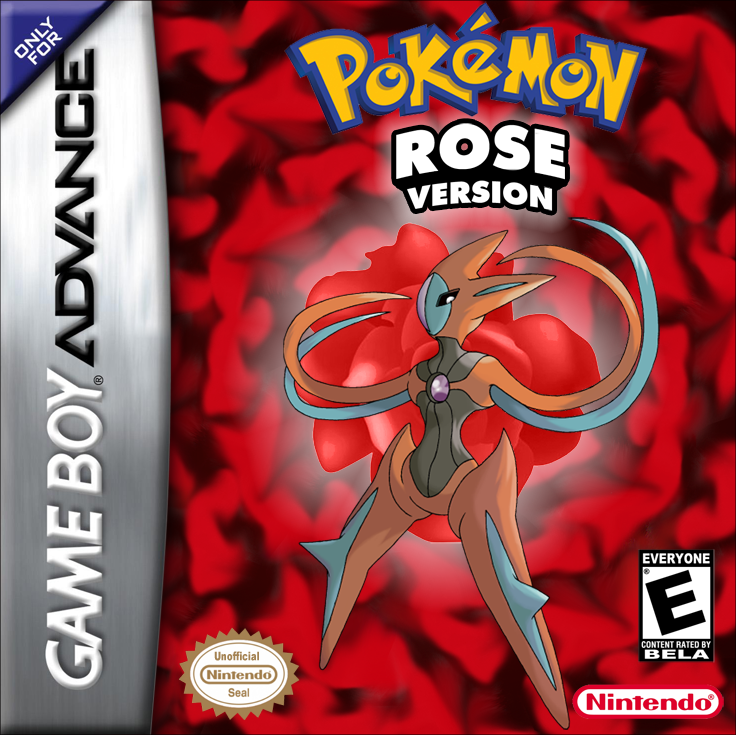 Enjoy the experience of exploring new routes, cities, and caves in Pokémon Rose Version! A year has passed since a young Pokémon trainer from Kanto defeated Team Rocket and became Kanto's Pokémon League Champion; likewise in the Hoenn region, a young trainer there put an end to Team Aqua and Team Magma's plans and defeated Hoenn's Pokémon League Champion. 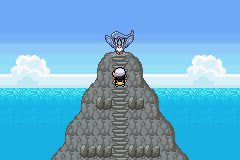 Why have Teams Rocket, Aqua, and Magma shown up in the Centiq region? What is the organization known as Thrasher and what is their goal? Could it have something to do with The Emerald Tablet, a mythical artifact believed to be hidden within the Centiq region? The answers to these questions and more await you! Anyway, that's enough from me. Now, let's get on with the show! 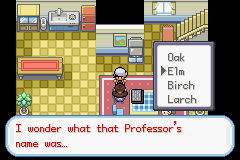 After running an errand for Professor Larch, Aster arrives at his first new destination: Elderoak Town! This small forest village has a large retirement community, as well as a school taught by the town’s elder, simply known as “Granny” to everyone. Unaware of Granny’s temperament, Aster casually walks inside to find out more about Pokemon, taking a seat at an empty chair in the schoolroom. “Is everybody here? Well then, let’s get started!” declares Granny. Aster, realizing a mistake has been made, tries to sneak out of the classroom before he’s noticed. He doesn’t know about Granny’s adept hearing, sounding the pitter-patter of feet. “Stay in your seat!” the little old lady exclaims at Aster, who in a shock immediately complies. He has been mistaken for one of her students! Granny begins to play a video for the students, designed to teach them how to catch Pokemon. Aster, having already known long ago how to do this and has seen Professor Larch do it many times, tries to take advantage of the situation and leave once more. “You again!” Granny bellows. This time she begins to walk over to you! “Do you think you know it all?” she asks inquisitively. “How about I give you a test in a Pokemon battle?” Quickly, the teacher sends out a Spearow with a menacing look, certainly used to giving that look as if it were to intimidate small misbehaving children. But Aster has his own Pokemon, too! Sending out the Pokemon you received from Professor Larch, you quickly dispense of the sparrow Pokemon, apparently only good at using its Leer attack to frighten Pokemon and students alike. Granny comes to the realization that you are not, in fact, one of her students. Just then, the teacher’s son, a grown man himself, walks in with a small boy under his arm. Evidently this was the missing student whose chair you had sat in. “I saw a big yellow Pokemon run past here!” the boy shouted. Clearly he was troubled by something he saw outside. It could have been the reason he skipped class. What was this big, yellow Pokemon he spoke of? What kind of big, yellow Pokemon are capable of running around in the Centiq region? Could it have been the crystal beast...Raikou? 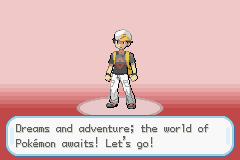 Thinking nothing of it now, Aster continues on his journey so he can face his first gym battle in Bloomful City. To get there, however, Aster must travel across a field full of grass Pokemon. This shouldn’t be much of a problem, since Aster’s Pokemon is much stronger than most of the grass Pokemon around. After battling a few trainers on his way to the next town, Aster is soon approaching the end of the grassy field. With only a little way left to go, and the buildings of Bloomful near on the horizon, Aster is swiftly met with a shocking site. “Finally we have caught up with you, Raikou,” stated a man dressed all in black, with a large red “R” on the front of his outfit. 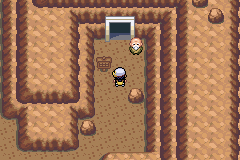 Two more men in a similar outfit are standing next to a big, yellow Pokemon that has become immobilized by traps that have been dug into the ground. “It appears the snares we set have done their job!” The crystal beast growled in anguish. “You will now become a prize for Team Rocket!” shouted the man, throwing a purple and pink Pokeball at the legendary creature. The Pokemon is instantly caught without any resistance. Was that a Master Ball that they just used? 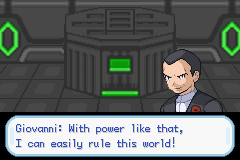 One of the two men who were standing next to the legendary Pokemon retrieves the Pokeball and stores it away. “Our client will be pleased that everything has taken place without incident,” the man who threw the Pokeball muses. Aster approaches the three men, who have recognized that they are being watched. “Hey, you there kid! You didn’t see anything, did you? Well, I’ll have to take care of that!” the man who threw the Pokeball shouts. Sending out a Zubat, the Team Rocket grunt is poised to take you on, while his fellow grunts have escaped. Aster sends out his Pokemon and defeats the flying bat Pokemon! 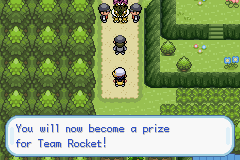 The Rocket grunt is distraught that a mere child could be capable of beating him. “You better stay out of our business!” he shouts at Aster. 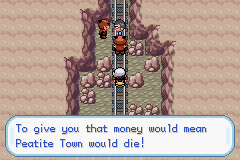 “And our client’s as well!” Who would Team Rocket’s client be? Unbeknownst to Aster, and indeed much of the Centiq region, a mysterious organization named Thrasher is secretly working to collect many powerful legendary Pokemon, as well as be the first to have ever found the legendary Emerald Tablet. But for what purpose? Who is their Leader? Could it be the strange man in blue, who demanded that the good professor tell him about the Tablet? Their goals, their influence, their leadership, their very existence… all things about Thrasher are shrouded in secrecy. If I do say so myself, a well-written storyline is to be found in this game! There are eight gyms and the Elite Four to beat, just like a classic Pokemon game, yet there are plot twists around every corner! A special post-E4 challenge is available, too! 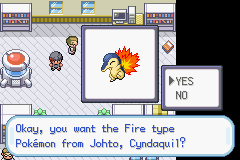 All legendary Pokémon from Kanto, Johto, and Hoenn make an appearance! Some Pokemon from later generations as well! You have the freedom to choose any of the first four generation's starter Pokémon as a starter. Choose wisely! Teams Rocket, Magma, and Aqua all make appearances. What could their reasons be for turning up here? New items will be included in the game. This game is sure to provide players with many new items to collect and use. Modified TM list. You'll have to rethink your options for moves! Changed movesets. Pokémon will be able to learn moves they normally were not able to. It will be a surprise to find out what! New in-game trades. The player will certainly need these Pokémon to complete their Pokedex! Music is composed by YouTuber SuperiorLarxene. These themes will, of course, use different instruments in-game. Mapping: Pretty much done. 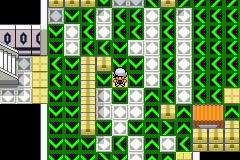 The only maps left to be made are for events that take place after beating the Elite Four. Spriting: Most everything here is done. What little remains, I should be able to get done! Mossy Stone: This item lets you evolve Eevee into Leafeon. Icy Stone: This item lets you evolve Eevee into Glaceon. Mist Stone: This item lets you evolve Eevee into Sylveon. Pokéwalker: This is a portable Daycare! And you don't even have to pay money to use it! Fossil Egg: A fossilized Pokémon Egg. When you revive it, it could hatch into one of a number of possible Fossil Pokémon. 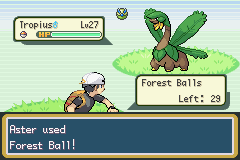 Forest Ball - A new Ball to replace the Safari Ball, it's used in the Forest Park, Rose's version of the Safari. Rose Ball - Has a higher catch rate for Grass and Fairy-type Pokemon. Magnet Ball - Has a higher catch rate for Metal and Electric-type Pokemon. Retro Ball - A Poke Ball with an old-school capsule design! Aqua Ball - Team Aqua's personal Poke Ball. Has a higher catch rate for Dark and Water-type Pokemon. Magma Ball - Team Magma's personal Poke Ball. Has a higher catch rate for Dark and Fire-type Pokemon. Rocket Ball - Team Rocket's personal Poke Ball. Has a higher catch rate for Dark and Poison-type Pokemon. In battles, you'll see the Grunts actually use these Balls for their Pokemon! In addition to this, I've included some Balls from Gen 2 and 4. These include the Fast Ball, Moon Ball, Heavy Ball, Quick Ball, Dusk Ball, and Heal Ball. In addition to having new typing and getting a special move, each of these new formes have different stat spreads. The two new Rotom formes have stat distributions different from the original five Rotom appliance formes. Tank Rotom has bulkier Defense and Special Defense, and slightly higher Special Attack than other Rotom formes do. Drone Rotom has a much higher Speed stat than other Rotom formes, as well as higher Special Attack. For now, these two formes are only a tease; they will not appear in the next beta. These two formes are obtained in a secret place that is very well guarded, as you could imagine military-grade machines would. 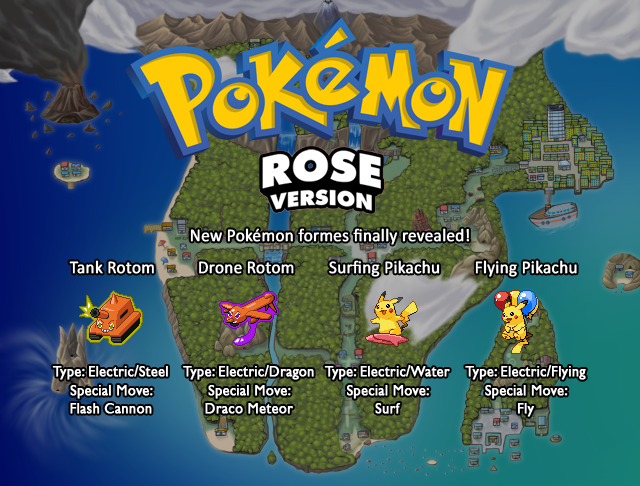 Any Pikachu you catch in Rose can become a Surfing or Flying Pikachu, and will be available in the next beta. If you take a Pikachu to a special tutor at the Beach Resort, and have the corresponding HM, that Pikachu will become either Surfing or Flying Pikachu after learning Surf or Fly. Both the Surfing and Flying formes have slightly higher stats which favor their respective moves. A Surfing or Flying Pikachu can still evolve into a normal Raichu, which will then have either Surf or Fly, a move it normally cannot have. This means there's really no downside to making your Pikachu become one of these two formes! 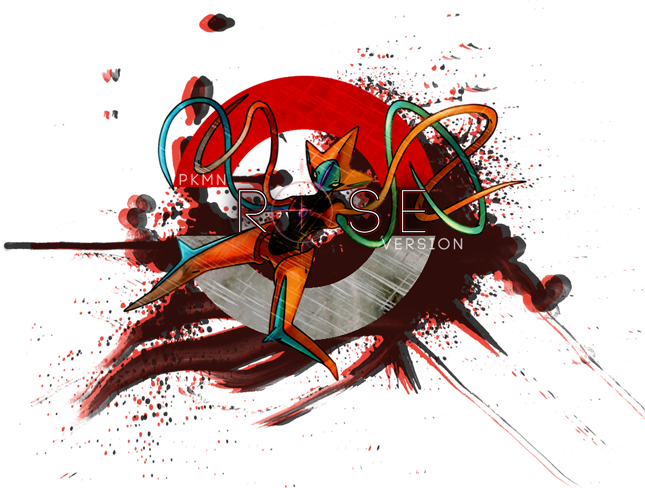 Like Pokemon Rose on Facebook! Use any of these support banners in your signature to show your support for Pokémon Rose Version! Q. How do you play this game? A. 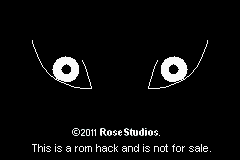 After obtaining a clean copy of an English FireRed ROM (find this yourself), use a patching utility like Lunar IPS to patch Pokemon Rose to the English FireRed ROM. It's very easy, but if you do need a detailed explanation, one can be found here. Diegoisawesome: Super cool dude whom I love, he has helped me debug some things I was struggling with and also let me use some of the music from his lovely Crystal remake hack, Crystal Dust. Also pretty sure I read his XSE guide when I was learning to script! Touched: ASM and other help, I love talking to this dude! November 9th, 2009 (2:17 PM). Good luck with this. It looks very promising. I can't really help with scripting, but I like the beginning of the story. The screenshots are also very well done. Good work! November 9th, 2009 (3:18 PM). November 9th, 2009 (8:38 PM). Interesting story, it seems like an interesting addition to the eight gyms/eight badges theme. Gyms still work, as long as there is an interesting plot taking place as well. I like your map and your banner, as well as the screenies. Keep up the good work, good luck with scripting. November 9th, 2009 (11:02 PM). Edited November 27th, 2009 by Bela. I updated the image of the sketch with the names for each town, as well as the location of the Pokemon League Headquarters. I also added a "Features" section to clarify a few things about this game. I will try and post these images in a way which resembles how the maps connect together in-game, although this won't always be perfect. I may try and put all the maps together and make a world map that way too, so look for that in the future! November 10th, 2009 (12:14 PM). I like the idea of piecing the maps together like that, it reminds me of an old G/S guide I once owned. Brownie points for the nostalgia! November 10th, 2009 (3:10 PM). I really like the look of this hack! This is my first ever post here but I thought i'd try out making a banner. November 10th, 2009 (3:16 PM). looks like your going Nintendo style on this one. but thats just how you map i guess. Send a private message to Glitch. Find all posts by Glitch. Find threads started by Glitch. November 10th, 2009 (5:15 PM). November 10th, 2009 (5:44 PM). Also, on a different note, for music, would you want original sounding music, or stuff from different games? November 11th, 2009 (11:53 PM). I know the mapping style is nintendo style but it looks empty..maybe add more trees and more things in.And for the story,its sounds ok..hope to see more updates. November 12th, 2009 (12:26 AM). Edited November 27th, 2009 by Bela. Thanks for the banner! I now have two banners, both of which can be seen in the first post. @mrhaxmaster: I have wanted this hack to be closely related with the official Pokemon games, so the way the map appears is no coincidence. My town is differentiated by housing locations for the Professor and Player. The location of the body of water is a compromise between Pallet's and New Bark's locations (making for a reference to being in-between these two game's story lines). I do agree that it needs to be edited, though. I might extend the beach further out, and probably add more trees. 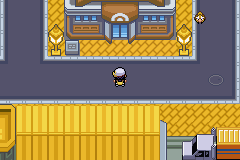 Today I'm posting the maps of the second route, the first town with a gym, and the route directly east of it. 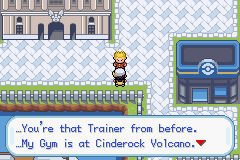 It's a game where the fire starter isn't at a disadvantage for the first gym?! That's right! The building on the far left in Bloomful is a greenhouse, the house on the second route is where the player obtains a Togepi egg, and the structure on the third route is a construction site. Perhaps it will be finished some time later in the game? There are cut bushes in a few places along route two, including in front of the house on that route. There is also a cut bush between the small trees in Bloomful City, blocking off the way west. Another lies near the gap in the trees behind the greenhouse, leading to an item. November 12th, 2009 (12:30 AM). November 12th, 2009 (10:53 AM). Now, I gotta say, what is shown in the 1st post is impressive, however the maps do need work. No offense, but they kinda let it down to me. And also, did you read any scripting tutorials? We did used to have a tutor thread (didn't last long), but tuts are best to be read first, and then ask. As for the maps... I know you are aiming for Nintendo style (or so it is thought), however that isn't always the best. No. 1: Too many flowers. I know that is the point, but there is a difference between flower city and flower sea. No. 2: The windows in the gym roof and big building look... Well, don't. Only experiment with it if you have new tiles inserted, or something. Errmm... The other 2 maps in your last post have only the problem of too much squareness (and the greenhouse isn't too good when looked at, but new tiles again...). But for a first hack, not too bad. November 12th, 2009 (1:57 PM). Looks like a good concept. I'd like to see the game when more progress is made on it. When it comes to the maps its been said above. It'll be interesting to see the final draft of the world map, good luck! November 13th, 2009 (7:38 PM). I'll have to edit those maps; thanks for your suggestions! The greenhouse has always bothered me, as it is not a greenhouse more than it is a building with windows on the roof. I also can see how there are way too many flowers in Bloomful, so I'll make sure to reduce that number. As hinted at by the banner in the first post, the "mascot" of this game will be Deoxys. The Facility Grounds, a former coal-fed power plant which converted to hydroelectric power when its coal resources began to be depleted. It is said a catastrophic event caused the power plant's original electrical grid to be destroyed, leaving most of the Centiq region in a ruined state until it was repaired and renewed. The electricity generated from the Facility Grounds is mostly used to power Marvelight City, with the rest used in most homes in the other towns of the Centiq region. November 14th, 2009 (9:32 PM). This is looks like a very interesting game. :) I like what I see so far. November 15th, 2009 (12:58 AM). Edited November 19th, 2009 by Bela. The three large buildings in the top left are the Devon Corp. - Centiq branch, Lancaster Corp., and Silph Co. - Centiq branch, respectively. 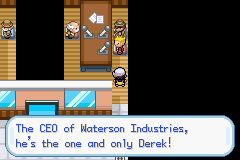 Lancaster Corp. is the Centiq region's version of Silph/Devon; the Lancaster Corp. owns all of the Pokemon Centers and Marts in the Centiq region, as well as being a realtor for houses. The house with grass surrounding it is the only one in the whole town which has not been demolished for the construction of businesses. It goes without saying that some business owner has prevented from such happening. South of this house is the Marvelight Science Center, which also happens to be this city's gym. The house with a mail box in front of it is Cabe's House, the Centiq region's administrator of the PC Storage System. Well, the name speaks for itself. This is the map which leads to the S.S. Waterson. Off to the right is that iconic truck, which has an actual purpose in this game! But what ever could that be? November 15th, 2009 (11:39 AM). I find it interesting how you have it strictly Nintendo style, but that makes the variety of the maps... limited. Is there really no room for variation? P.S. I should have results on that project in a week, two at the most. November 15th, 2009 (10:26 PM). Hello my name is Chris ill play along in helping you make this game it seems great ill take care of the scripting if you like i can script and make events email me at chriskingz2008@hotmail.com and well talk more about this. November 16th, 2009 (1:14 AM). Edited November 27th, 2009 by Bela. The S.S. Waterson is essentially the same as the S.S. Anne as far as the overworld map is concerned (I will show indoor maps at a later time), so we're moving on to the next town! 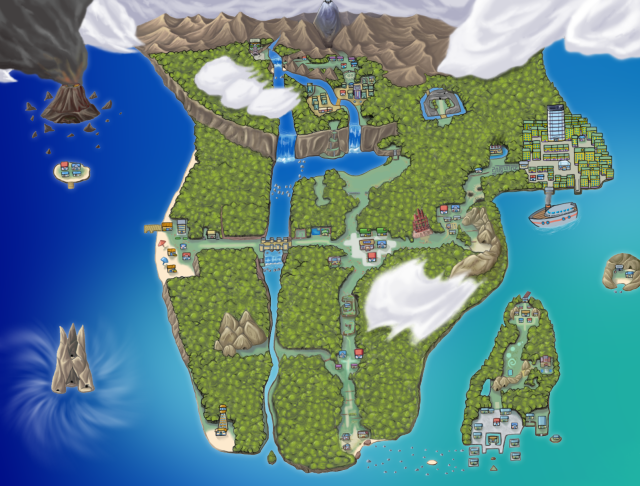 Today's maps are the third gym town, Mantra Town, as well as the two routes which follow. Mantra Town: A town with many ancient tablets planted into the ground. The legends inscribed on these tablets speak of a terrible event which occurred on what is now but a small island, at the Azurect Community. What was this event? For now, that remains a mystery. The tablets also speak of an Emerald Tablet said to hold a great power. The house on the left in front of the mound has an entrance behind it which leads to a small cave. Inside is an old man who quizzes you on the texts inscribed on the ancient tablets spread throughout the town. If you can answer his questions correctly, he will reward you with HM04 - Strength. As one could guess, the Mantra Town gym is a psychic gym. Grumpig sure would be a difficult challenge for Fire users! The cry of Suicune grabs your attention! As you walk closer to the source of the sound, a Hiker shows you where he saw some shady characters walk to - leading to the small path of grass within the trees in the bottom right of the map. However, despite the Hiker's size and stature, he leaves the bravery part to you! Fight a few Rocket Grunts until you get to the end of the path, where a strange individual in a black cloak with spikey, almost white hair has apparently cornered poor Suicune. Based upon the design on the back of his cloak--a blue cross with a PokeBall in the center--this does not appear to be a Team Rocket member. In fact, the man reveals himself to be a part of a whole entire other organization! You fight the mysterious individual and beat him. He does not tell you his name, but he does tell you to "Heed Thrasher's wrath." With this, he and Suicune vanish. November 17th, 2009 (9:36 PM). Edited November 27th, 2009 by Bela. $mom3 1 = Good morning, dear! $oak1 1 = Was it Professor Oak? $elm1 1 = Was it Professor Elm? $birch1 1 = Was it Professor Birch? 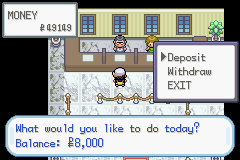 $oak3 1 = That's right, nowI remember!\pIt was Professor Oak from the\nKanto region! $elm3 1 = That's right, now I remember!\pIt was Professor Elm from the\nJohto region! $oak3 1 = That's right, now I remember!\pIt was Professor Birch from the\nHoenn region! $mom9 1 = Professor Larch should be\noutside.\pI'm sure his long trip has\nmade him miss being home! I am aware that this script is neither complete nor accurate, as it is just a draft. Some help with this would be appreciated! This is an earlier map of the Thrasher Estate, so yes I know the lower set of trees are one tile up. This map is accessed by using Rock Smash and walking past the sign which reads "PRIVATE PROPERTY: KEEP OUT" along the side of Route Six in the previous post. The Thrasher Estate isn't accessed until later on in the game; inside you will, not surprisingly, be fighting top-ranking members of Thrasher. The Thrasher Mansion itself will require the player to walk on the rooftop in order to gain access to a particular area within--leading the player to walk on top of the glass windows on the roof and shatter them as if they were the ice tiles used at Icefall Cavern! Of course, that map I will show at a later time. Paristorm City is where you will find the fourth gym. It is a Dragon-type gym and yes, the player must fight a Kingdra this early in the game. The house to the far right of the map is where a move tutor lives; it is this same move tutor who will be able to teach the starters Frenzy Plant, Blast Burn, and Hydro Cannon, although you can't do this until later in the game. 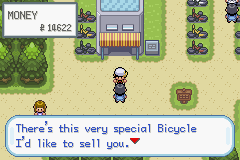 Among the houses is one occupied by a Team Rocket grunt; this grunt is in the midst of running a scalping operation by buying and reselling all the tickets for a ride back to Marvelight from Mantra Town. 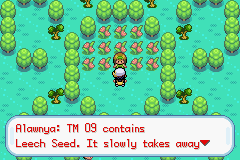 (As the fifth badge allows for the use of Surf, and the Fly HM has yet to be found, you must backtrack to Bloomful without shortcuts!) Defeat the Team Rocket Grunt and he'll run away. Track him down in Rainfall Cavern and use Strength to move a boulder out of the way to find him again. Cornered, the Rocket Grunt has no choice but to give you a ticket. After doing so, he flees. The Shrine at the south edge of the map serves a purpose, but what EVER could that be? Note: YES I know there is a lot of empty water in this map, but that's just how I ended up making this map. I might reduce the amount of wasted space in this part by pushing the move tutor's house further down. To the left of this map is a water route which connects Springate to Paristorm. November 18th, 2009 (1:04 AM). This is a blooming rose, alright. Why don't you try searching on the search engines for someone who can script? November 19th, 2009 (12:27 PM). November 19th, 2009 (8:15 PM). All of the gym leaders/elite four/etc are already made up. In fact, I have the entire story already put together. I've thought that if I all-out revealed everything I planned to do with the story, then all of the surprises I have in store for people who actually play the game (which I would assume would include people who see this thread), it would remove that element of surprise I want to retain. Incidently, Mae and Eyelene are sisters. Here are the maps west of Bloomful, accessible after you return from Paristorm City. (You obtain Cut on the S.S. Waterson, so you are able to cut that bush down now!) These three maps make up this game's path for the player to use the bike and hatch eggs. Route Eight is a straight shot to the west with trainers along the way. 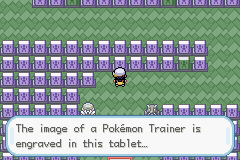 This map also has the game's Pokemon Daycare, where of course the player can breed Pokemon. 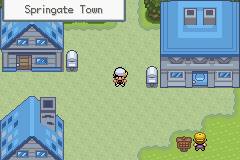 Route Nine is the Resort Bridge, which also has trainers along the way. Underneath is a hidden area where the three water starters--Squirtle, Totodile, and Mudkip, can be obtained, but of course this cannot be accessed until the player can use Waterfall. 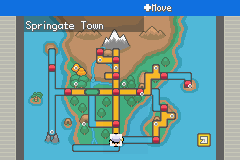 Route Ten is another straight shot west with trainers along the way, with the game's Safari Zone also on the route. The gap in the treeline is blocked by a sign in the form of a person event, which leads to a secret area within the Safari Zone. (But more on that much later!) There is also a long strip of grass at the bottom of the map with trainers and an item. Along Route Ten you will encounter a group of Team Rocket grunts. This time, they have captured Entei! (I know I didn't post this earlier, but this same event happens with Raikou on Route Two.) 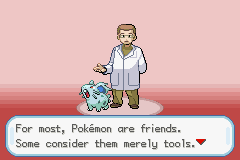 Fight the Team Rocket grunt closest to you, and after his defeat, the group will run off with Entei. With this event out of the way, head west to the Vacation Resort! The maps are attached at the bottom in the order they are connected in the game; imagine the Vacation Resort to the left of the three maps and Bloomful City to the right.